Optimum Economic Scheduling Strategy of Islanded Multi-Microgrid. 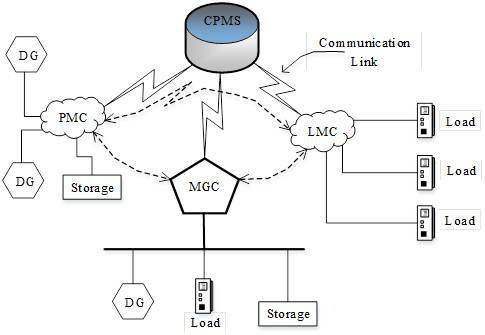 Asaduz-Zaman A., Rahaman B., Shawon C.
The paper presents a new methodology of the multi-microgrid (MMG) system is developed for large-scale integration of microgrids (MGs) and distribution generation (DG) units. The different controllable MGs, DG units and loads for MMGs system requires an efﬁcient dispatch strategy in order to balance supply demand for optimizing the total cost of the integrated system. This paper described an optimum economic dispatch strategy of islanded MMGs. To optimize the system operating and running cost, genetic algorithm have been used and searches the optimum value of the output parameters like power produced by the controllable DG. The objective function comprises input fuel cost, operation cost, as well as the cost of emissions subject to various system constraints. The proposed optimization process is applied to a newly designed MMG system that has been operated under various constraints. Simulation results guaranteed the validity the proposed optimization method. Keywords: Multi-microgrid, Distributed Generation, Cost Function, Economic Dispatch, Genetic Algorithm.